My one year old son loves airplanes and my father is a pilot, so I began the task of brainstorming a pet Halloween costume that would include an airplane. 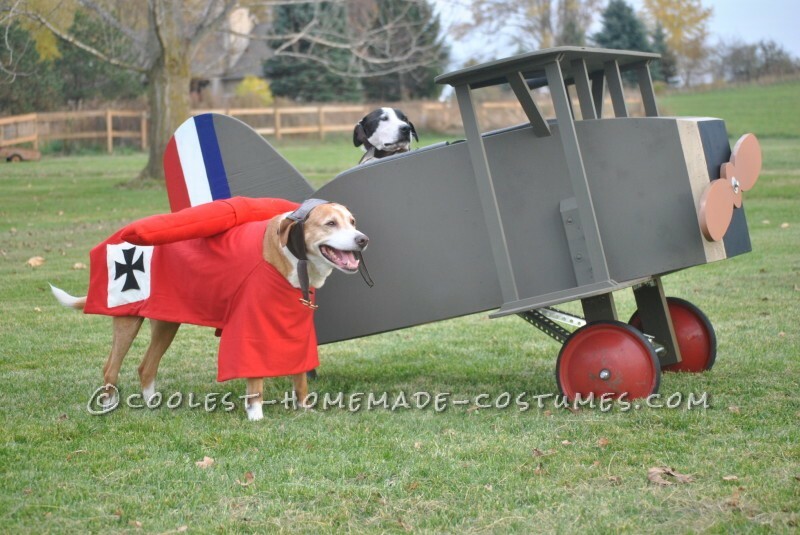 My dog, Santo, is black and white so it hit me one day that I should make a costume that revolves around the infamous “dogfight” against Snoopy and the Red Baron. 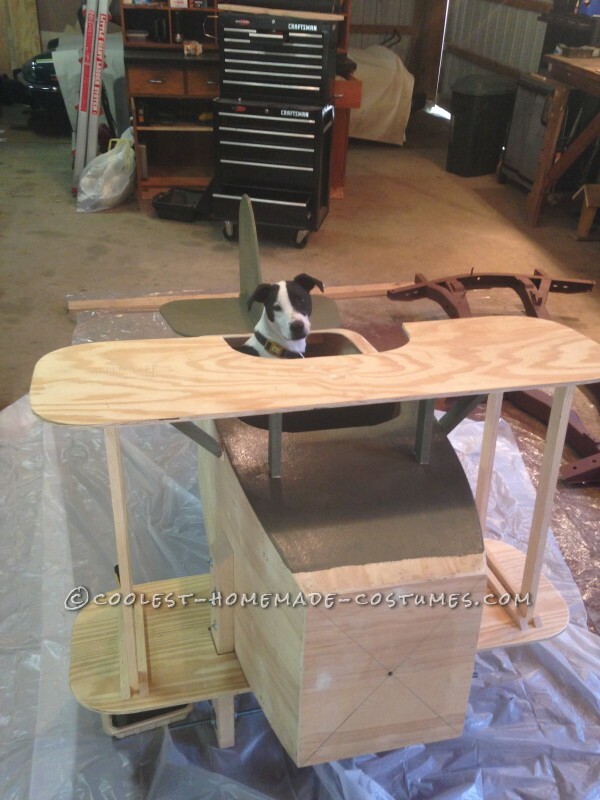 I enlisted my father’s help to build a plane that would seat Santo and I began the task of making the dogs costumes. Making Sure the Dog FIts! Let’s Build a Dog Friendly Airplane! My dad had a picture of Snoopy’s plane in his mind and went about creating it from scratch. He used wood for the body and included a cockpit that was big enough to fit the dog, a propeller that moved, and wheels that worked. The wheels he used were from his 1960’s soap box derby car. 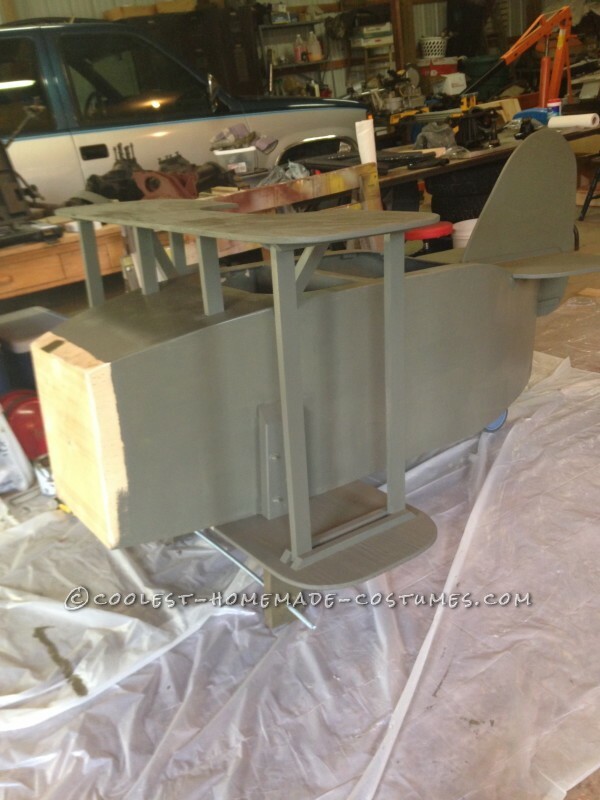 Once he finished building the plane, I painted it using regular flat interior paint as well as red, white and blue latex paint for the strips and circles. I really enjoyed the painting, but trying to make the circles and stripes perfect was definitely the most difficult part of the paint job. Snoopy’s costume was really the easiest part of the project because Santo was already black and white so all I needed to do was add an aviator cap and scarf. I made my own pattern for the cap which was much easier said than done. Once it finally came together, I sewed the cap with brown pleather and cut slits on the sides to fit Santo’s ears. Velcro was added to keep the cap in place. 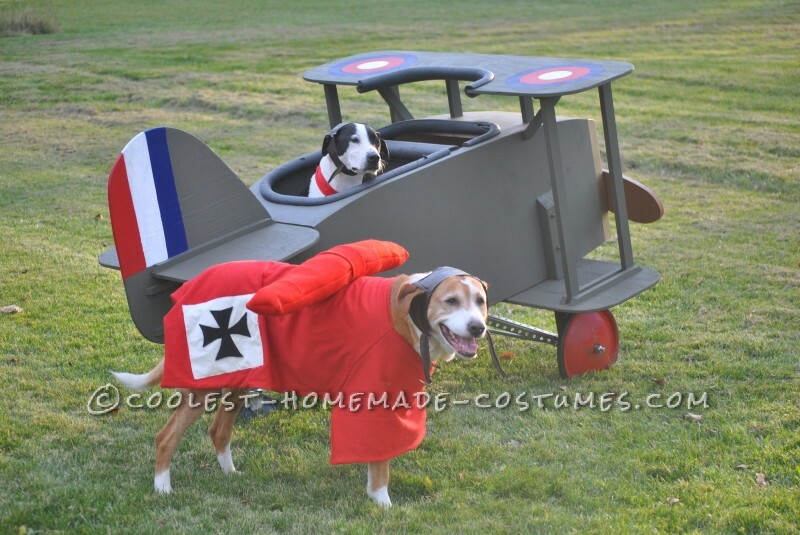 The next step was to create a Red Baron airplane costume for my dog, Ohana. I made my own pattern which mimicked a dog coat. Once the pattern was complete, I cut a piece of red fabric and sewed it together along with a strap and Velcro to hold the costume onto Ohana. I then began work on the design that is shown on the sides of the “plane”. I cut a square out of white fabric, then traced a cross design onto black felt, cut it out and glued it onto the white square with fabric glue. I then sewed the design onto each side of the plane costume. Next came the wings. I made another pattern and used that to sew a wing shape out of a piece of red fabric. I left a small hole on one end and inserted a dowel to ensure that the wings didn’t droop. I then added stuffing and attached the wing to the coat portion of the plane by sewing a red loop onto the coat and sliding the wing into the hole. The aviator cap was easy this time because I was able to use the pattern I made for Snoopy’s cap. I simply had to enlarge the pattern and then sew it together using the pleather and Velcro. Throughout the creation of the costume I continuously checked my work after each step by putting the costume on Ohana so I owe a lot of thanks to him for being such a patient dog! Snoopy and the Red Baron Finally Meet! The last step of the project was to put all the costumes together with the plane. I’m very lucky to have patient dogs. 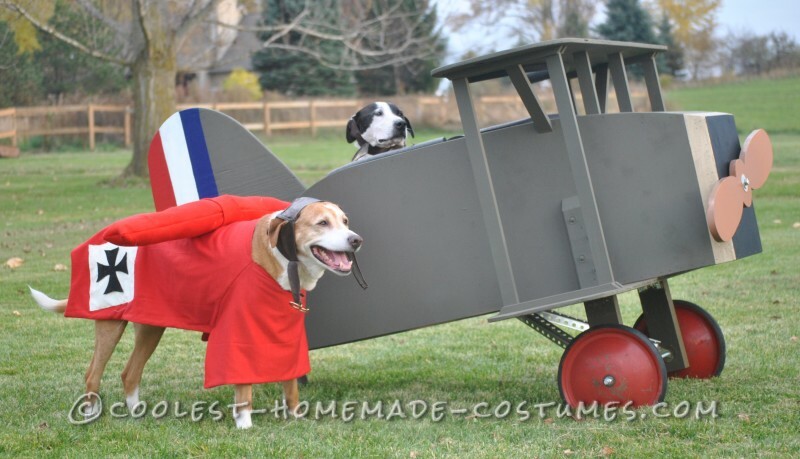 “Snoopy” enjoyed riding around in his plane and the Red Baron was perfect in his costume. It all came together perfectly for this infamous “dogfight”!